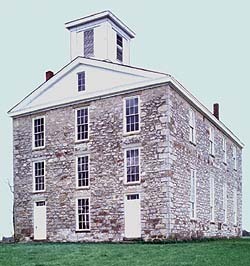 Built in 1839 and now a National Historic Landmark, this house was owned by Levi Coffin (1798-1877), a Quaker abolitionist. Because of his outstanding role in the operation of the Underground Railroad, Coffin has been termed its "president." 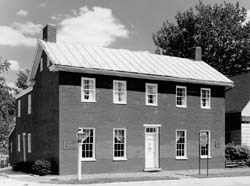 It is believed that Coffin and his wife Catharine helped more than 2,000 fugitive slaves escape to freedom, using this house as a principal depot. Coffin was born in North Carolina and in 1826 moved to Fountain City, at that time called Newport, where he operated a general merchandise store. In 1847 the Coffins moved to Cincinnati and opened a store that dealt in goods made by free labor and continued with their antislavery activities. Immediately after the issuance of the Emancipation Proclamation, Coffin worked to aid freedmen. In 1864 he went to England and was instrumental in the formation of an Englishman's Freedmen's Aid Society which contributed money, clothing, and other articles to newly freed African Americans. In 1867 Coffin attended the International Anti-Slavery Conference in Paris. Following this event he lived in retirement until his death in 1877. Coffin's accounts on his activities as the "president" of the Underground Railroad were published in an 1876 book entitled Reminiscences of Levi Coffin .